Home Breaking Featured Politics EXPOSED: Bola Tinubu, Adams Oshiomhole Plan Pres. Buhari’s Fake Endorsement For Femi Gbajabiamila Against North-Central’s Agitation To Produce Speaker. EXPOSED: Bola Tinubu, Adams Oshiomhole Plan Pres. Buhari’s Fake Endorsement For Femi Gbajabiamila Against North-Central’s Agitation To Produce Speaker. Buhari, Tinubu, Oshiomhole & Gbajabiamila. Inspite of the that the South-West geopolitical zone which has already secured the Vice President’s position, the “zone” that came fourth by the number of votes from geopolitical for the APC is also being pushed for “speakership” as against the North Central geopolitical zone that came third and has never produced leadership of the House of Representatives in 20years. 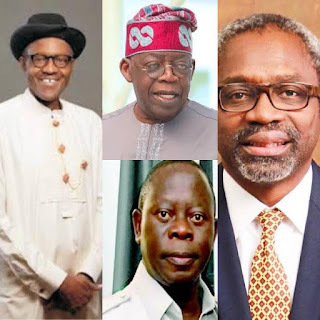 Asiwaju Bola Tinubu wants his stooge, Femi Gbajabiamila as Speaker of the House of Representatives by all means and the APC’s National Chairman, Adams Oshiomhole, who is an ally of Tinubu is at the forefront of the plot to place the control of the National Assembly in his hands. Plot to secure what was described as “Baba’s endorsement” so as to shut out the North Central zone that is agitating for the Speakership position was hatched in a meeting held in Tinubu’s residence last week and already, Oshiomhole has been able to secure an appointment for the APC returning and elected members of the House of Representatives to have a “dinner” with President Buhari on Tuesday, the 16th of April.